“It’s a culture, a genre, an addiction, a cure and so much more,” says the Jersey club producer, whose new mixtape is out now via Lit City Trax. As a young teen, New Jersey producer DJ TiGa was so inspired by the fired-up music of Newark-based Jersey club collective Brick Bandits that he went on to join them. Now 26, with over 10 years of producing experience under his belt, he's just released The Sound: Vol.1, the first in a series of mixtapes designed to introduce the world to his flexible take on one of dance music's most mutable forms. It's an infectious listen that turns time signatures upside down and inside out, lending ballads a funky edge and turn-up tunes a touch of melancholy. 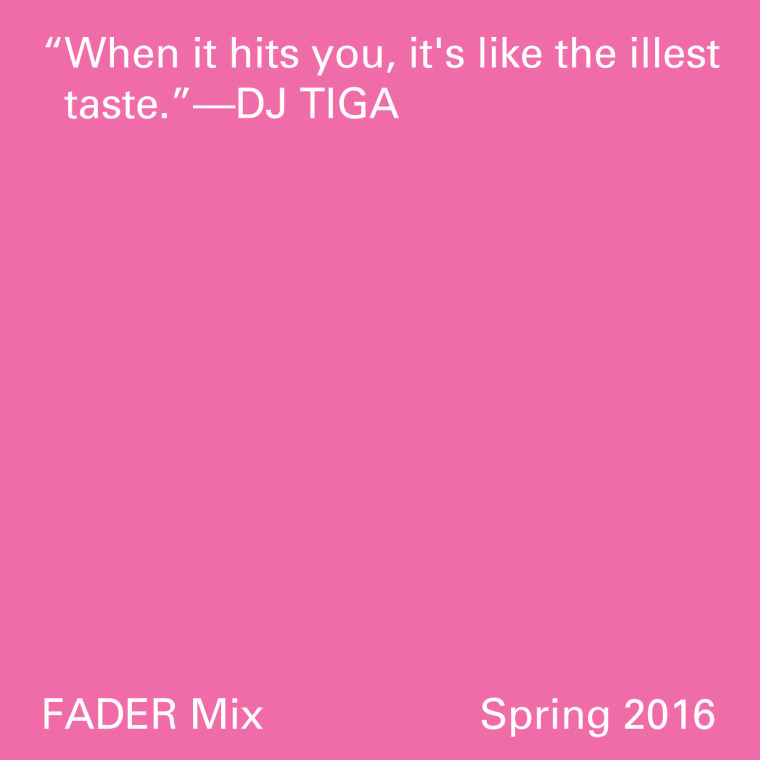 To celebrate its release, TiGa's made us a FADER Mix that doubles as a head-spinning primer on Jersey club's past, present, and future. If the #RunningManChallenge caught your attention, you definitely need to tune in. "I wanted to layout the birth and evolution of what Jersey Club has grown to be and its possibilities," TiGa tells us in the interview below. "It's a culture, a genre, an addiction, a cure and so much more." Embrace the kinetic energy below, and scroll down for an enlightening chat with the man himself. The Sound: Vol. 1 is out now for free download via Lit City Trax. I'm reading these questions at work surrounded by co-workers. I'm working a 9-5 as a chef. It pays the bills, but I'm sitting here thinking how I should be in my studio banging out tracks or at a party somewhere playing hella tunes and making people move. This mix has a lot of different productions of mine and some of my main influences. A lot of kids in the game won't know, or even care to know, who paved the way before them. But there are a lot of gems that our pioneers left behind that so few people have any clue about. Too many Jersey tracks got lost in time. Since there's a lot of Jersey club producers on the rise, and a lot of club-influenced producers worldwide, I wanted to impart a little knowledge on the fundamentals. I wanted to layout the birth and evolution of what Jersey club has grown to be and its possibilities; its a culture, a genre, an addiction, a cure and so much more. I know the rest of world isn't in tune like those from within Jersey club, but club music is everywhere and I'm just trying to spread this sound to the people. We've had our music synced with Pepsi, Coca Cola, Target commercials to name a few. My earliest musical memory had to have been me rapping for my church talent show when I was about 12. Around that time, I was listening to a lot of Eminem, D12, and last but not least 50 Cent. At the time everyone in my age range wanted to be a little like 50, with a du-rag and a fitted hat and and all that. How has Jersey club music evolved over the years, and where do you want to take it? Honestly, I don't know where to begin. All the equipment has changed. There's better access to software. Before, in the early days, people were making beats on hardware but now we have laptops that we can take anywhere. It has definitely been an upgrade from the first generation of Jersey club producers to the current wave. So many big artists I respect have played with the Club music format; Pharrell, Swizz Beats, Timbaland, Kanye West, Diplo, Lil Jon, and Missy Elliott to name a few. I'd like to bring Jersey Club into the greater musical consciousness. All these artist dabbled with the club sound but the culture and music has not been pushed to its full potential. Something is missing in club. Hopefully I can fill that void and bring Jersey club music to the people. That being said, I'm not simply a Jersey club producer. That has been my roots, where I learned to produce, but I experiment with a lot of different styles. That's why I have quite a few distinct styles within my own sound. What statement did you want to make with The Sound: Vol.1? The Sound: Vol.1 was a release for the people—for anyone who's ever shaken their legs to a Jersey club track. There are so many different flavors of Jersey club. I say flavors 'cuz when it hits you, it's like the illest taste. Outside of New Jersey, the world doesn't really have much authentic links to the music. The Sound: Vol.1 is a collection of my beats from over the years. I tracked it out with J-Cush to give people insights into my many different styles of Jersey club. The Sound is an ongoing mixtape series. Vol.2 and Vol.3 are tracked out already. Vol.4 will be done soon. I hope with my 10+ years of production in the culture, I will help give listeners some idea of what's been going on in the genre. The last book that had an impact on me would have had to have been 100 Greatest African Americans. There's a lot of African American history that the U.S. education system has left out. I like to stay learning. If I don't know something, I want to know. If I didn't know my roots I would feel left out of knowing myself as well as having the potential to become the best me. Bruh, I've been a professional chef for damn near six years! I don't have a favorite dish really but if I did, I don't think I could let that recipe out. Just ask J-Cush about my cooking.